Alaska’s military history and veteran population are both large parts of the state’s texture and culture. Yesterday was the 11th day of the 11th month, Veterans Day, sometimes referred to as “Remembrance Day,” depending upon your country of origin. Commemorating a day like this that falls on a specific date can sometimes be difficult for families, and particulary so on Veterans Day. Some schools are closed, some, open. Some parents have to work, some get a day off. So while it would have been nice to have a tidly little listing of possible celebrations for the entire family to reflect upon those men and women who have served our country, I thought going a bit more consistent in my approach would be a nice change of pace. 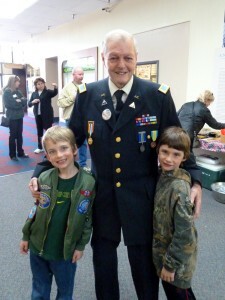 Alaska Veteran and AK Kids meet at the grand opening of the Alaska Veterans Museum in 2011. Alaska is a state rich with cultural and historical diversity, and that includes our veteran population. The 49th state has the highest number of veterans, per capita, and as a result, many opportunities exist to learn about the many ways Alaskans have contributed to our armed services, during both war and peace-time. Below are a few great options, some possibly unfamiliar, for honoring veterans who have passed through, over, and around Alaska during the past 100 years. The Alaska Veterans Museum is located on 4th Avenue in downtown Anchorage. Alaska Veterans Museum, Anchorage. This small but punch-packing museum is full of dioramas, posters, uniforms, photographs, and other memorabilia dating back to Alaska’s first role as Territorial Guard. 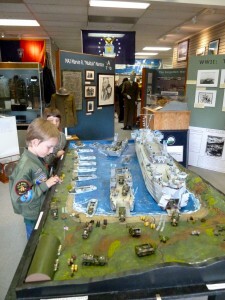 But the true value of the Alaska Veterans Museum is through the volunteers who selflessly spend hours and hours talking with visitors, updating exhibits, and advocating for the only museum dedicated specifically to Alaska vets. It’s pretty fantastic. Tomorrow, November 13, the museum will be FREE between the hours of 10 a.m. and 5 p.m., and an after-school stop is the perfect amount of time. We’ll be there, count on it. If you can’t make it, though, swing by over the winter months, Wednesday through Saturday, 10 a.m.-5 p.m. 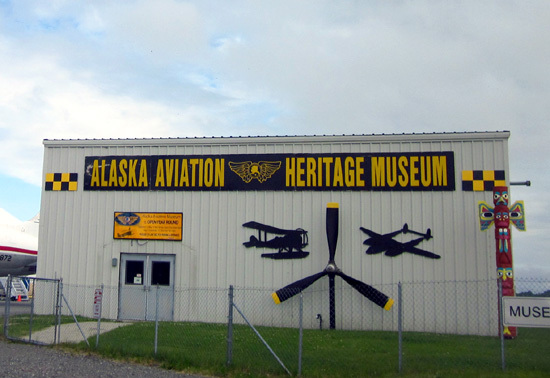 Located on the shores of Lake Hood in Anchorage, the Aviation Heritage Museum is a fabulous collection of aircraft in Alaska. Dramatic and solid, the Alaska-Siberia Memorial in Fairbanks is a must-see in Griffin Park, downtown. 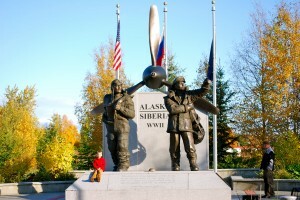 Alaska-Siberia Memorial, and Museum of the North, Fairbanks. A two-fer of military history, Fairbanks has quite the number of military and flight-related options for visiting families (another, the Pioneer Air Museum in Pioneer Park, is only open May-September). 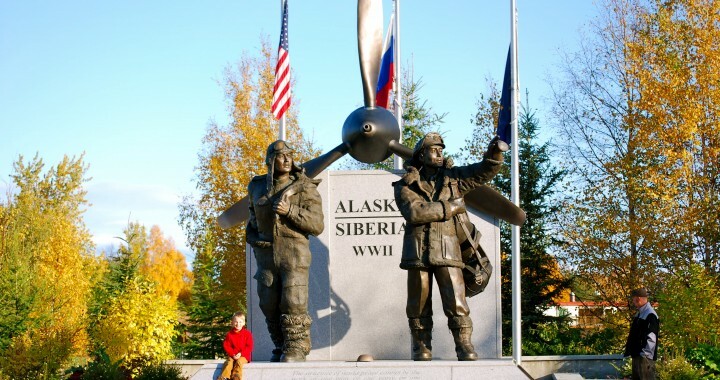 No matter the season, be sure to swing through Griffin Park in downtown Fairbanks for a look at the beautiful Alaska-Siberia Memorial that commemorates Alaska’s important role as an airway during WWII. Then, head to the University of Alaska Fairbanks campus and visit the Museum of the North’s exhibit about how life in Alaska changed once Pearl Harbor was bombed in 1941. Sobering and inspiring at the same time. 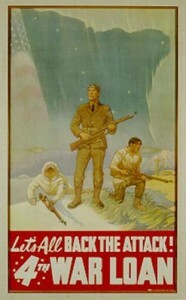 Best for older kids who have a grasp on the war efforts and Alaska geography. Open daily, all year, but hours do change in the winter. 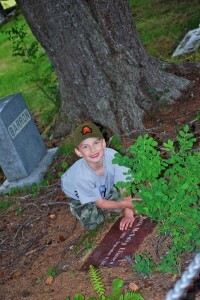 Often, Alaska veterans groups will gather here for commemorative events. 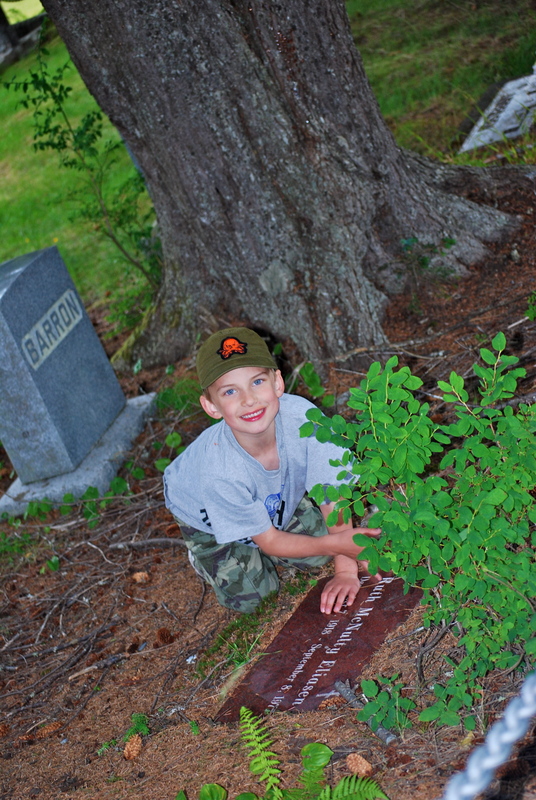 AK Kid investigates a headstone at the Sitka National Memorial Cemetery. 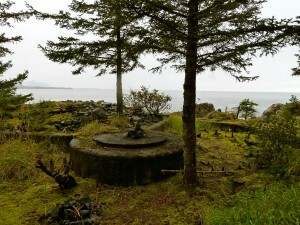 Sitka National Memorial Cemetery, Sitka. 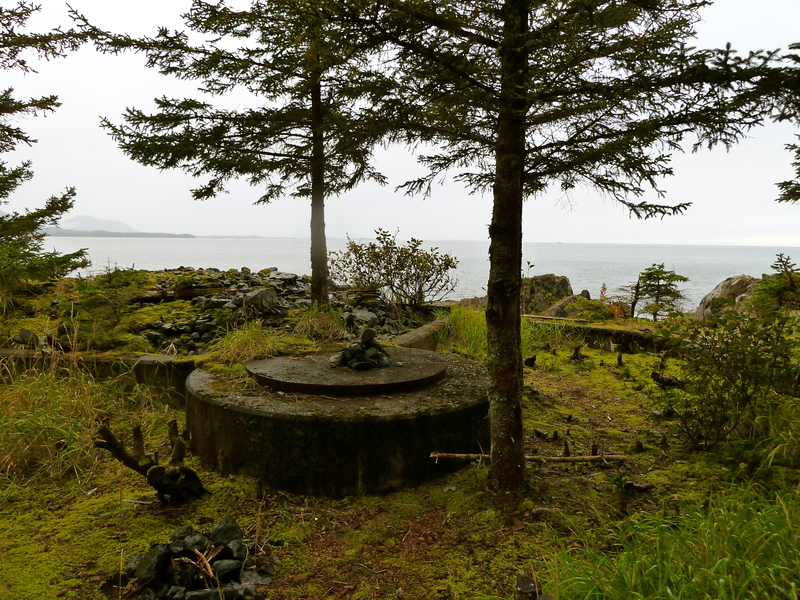 Cemeteries can be amazing keepers of history, and Sitka does such a beautiful job of maintaining this gorgeous, hilly complex a short walk from downtown. Visit. 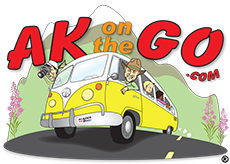 Walk around, and learn about just how long Americans have been in Alaska. Open daylight hours, all year. Anchorage Museum at Rasumson Center, Anchorage. Upstairs, in the section that walks visitors through the city’s history, a unique perspective takes shape about those who watched WWII and the Cold War emerge. We like the lifesize displays that show how our military men and women lived in quonset huts, traveled, and missed their families in this new and unfamiliar place known as the “Last Frontier.” Open daily. 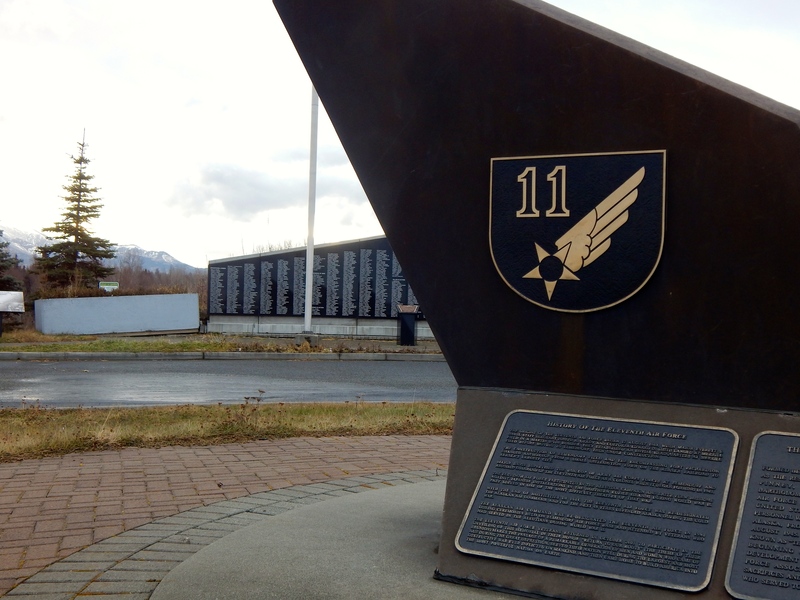 Visit Merrill Field’s south side and the 11th Air Force memorial in Anchorage. 11th Air Force and Airmen’s Memorial, Anchorage. Located at the junction of DeBarr Road and Lake Otis Parkway, along the south side of Merrill Field, sits a quiet memorial to those who flew in the cause of freedom. Names of those who participated in myriad transport and combat campaigns are listed, along with a dedicated plaque to those who were lost. The stark, bare peaks of the Chugach range in the background add to the richness of this little memorial, as will the planes taking off and landing just behind you. It’s a special place. “Never forget” has always been the rallying cry of veterans, and with so many now giving so much, this is an easy and enjoyable way to remind your children that Alaska veterans are special people, indeed. 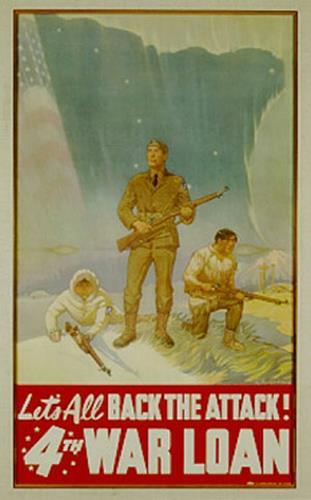 Posted in Museums and tagged Alaska Aviation Heritage Museum, Alaska Veterans Museum, Anchorage, Anchorage Museum, Fairbanks, Museum of the North, Sitka, Sitka national cemetery.